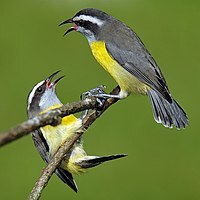 This is a list of U.S. state birds. ↑ "Alabama State Bird". Alabama Emblems, Symbols and Honors. Alabama Department of Archives and History. 2006-04-27. Retrieved 2007-03-18. ↑ "Official Alabama Game Bird". Alabama Emblems, Symbols and Honors. Alabama Department of Archives and History. 2003-11-17. Retrieved 2007-03-18. ↑ "Alaska State Bird". Alaska History, Geography, Population and State Facts. Fact Monster. ↑ "Arizona State Bird". Arizona State Bird- Cactus Wren. 50 States. ↑ "Arkansas State Bird". Arkansas State Bird- Mockingbird. About. ↑ "California State Bird". California State Bird- California Quail. 50 States. ↑ "Colorado State Bird". Colorado State Bird- Lark Bunting. About. ↑ "Connecticut State Bird". The State Bird. State of Connecticut. ↑ "Delaware State Bird". California State Bird- Blue Hen Chicken. 50 States. ↑ "District of Columbia State Bird". Washington DC State Symbols. 50 States. ↑ "Florida State Bird". Florida State Bird: Mockingbird. SHG Resources. ↑ "Georgia State Bird". Georgia State Bird Brown Thrasher Toxostoma rufum. Netstate. ↑ "Georgia Secretary of State - State Game Bird". Georgia Secretary of State. State of Georgia. ↑ "Hawaii State Bird". The Nene Goose- Branta Sandvicensis-Hawaii's State Bird. Aloha-Hawaii. ↑ "Idaho State Bird". Georgia State Bird Mountain Bluebird Sialia currucoides. Netstate. ↑ "Illinois State Bird". State Symbols. Learn Illinois. ↑ "Indiana State Bird". Indiana State Emblems- cardinal. Indiana Historical Bureau. ↑ "Iowa State Bird". Iowa State Bird Eastern Goldfinch Carduelis tristis. Netstate. ↑ "Kansas State Bird". Kansas State Bird Western Meadowlark Sturnella neglecta. Netstate. ↑ "Kentucky State Bird". Kentucky's State Bird: The Cardinal. Kentucky Department for Libraries and Archives. ↑ "Louisiana State Bird". Louisiana State Bird: Brown Pelican. SHG Resources. ↑ "Maine State Bird". 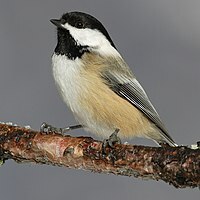 Maine State Bird, the Chickadee. Wells Maine. ↑ "Maryland State Bird". Louisiana State Bird Baltimore Oriole Icterus galbula. Netstate. ↑ "Massachusetts State Bird". Massachusetts State Bird: Chickadee. SHG Resources. ↑ "Michigan State Bird". Michigan State Bird American Robin Turdus migratorius. Netstate. ↑ "Minnesota State Bird". Minnesota State Bird Common Loon Gavia immer. Netstate. ↑ "Mississippi State Bird". Mississippi State Bird: Mockingbird. SHG Resources. ↑ "Mississippi State Symbols, Emblems, and Mascots". SHG Resources. ↑ "Missouri State Bird". Missouri State Bird: Bluebird. SHG Resources. ↑ "Montana State Bird". Michigan State Bird Western Meadowlark Sturnella neglecta. Netstate. ↑ "Nebraska State Bird". Nebraska State Bird: Bluebird. SHG Resources. ↑ "Nevada State Bird". Nevada State Bird, mountain bluebird. Val-U-Corp Services, Inc.
↑ "New Hampshire State Bird". New Hampshire State Bird: Purple Finch. SHG Resources. ↑ "New Jersey State Bird". NJ Senate No. 241. NJ Home. ↑ "New Mexico State Bird". New Mexico State Bird: Purple Finch. SHG Resources. ↑ "New York State Bird". New York State Bird Bluebird Sialia sialis. Netstate. ↑ "North Carolina State Bird". Cardinal- North Carolina State Bird. NC Department of State. ↑ "North Dakota State Bird". North Dakota State Bird Western Meadowlark Sturnella neglecta. Netstate. ↑ "Ohio State Bird". Ohio's State Bird- The Cardinal. Ohio History Central. ↑ "Oklahoma State Bird". Oklahoma State bird. Birds of Oklahoma. ↑ "Oregon State Bird". Oregon State Bird Western Meadowlark Sturnella neglecta. Netstate. ↑ "Pennsylvania State Bird". Pennsylvania State Bird: Ruffed Grouse. SHG Resources. ↑ "Rhode Island State Bird". Rhode Island State Bird: Rhode Island Red. SHG Resources. ↑ 45.0 45.1 "SC Statehouse Student's web page, State Symbols and Emblems, State Bird". South Carolina General Assembly. Archived from the original on 2007-07-02. Retrieved 2007-07-19. ↑ "SC Statehouse Student's web page, State Symbols and Emblems, State Wild Game Bird". South Carolina General Assembly. Archived from the original on 2007-07-06. Retrieved 2007-07-19. ↑ "South Dakota State Bird". South Dakota State Bird Ring-necked Pheasant Phasianus colchicus. Netstate. ↑ "Tennessee State Bird". Tennessee State Bird: Mockingbird. SHG Resources. ↑ "Tennessee State Symbols". Tennessee State General Assembly. ↑ "Texas State Bird". The Texas State Bird: Mockingbird. Lone Star Junction. ↑ "Utah State Bird". Utah State Bird California Gull Larus californicus. Netstate. ↑ "Vermont State Bird". Vermont State Bird- Hermit Thrush. About. ↑ "West Virginia State Bird". Netstate. ↑ "Wisconsin State Bird". Wisconsin State Bird: Robin. SHG Resources. ↑ "Wyoming State Bird". Wyoming State Bird: Robin. State of Wyoming. This page was last changed on 8 July 2018, at 20:39.